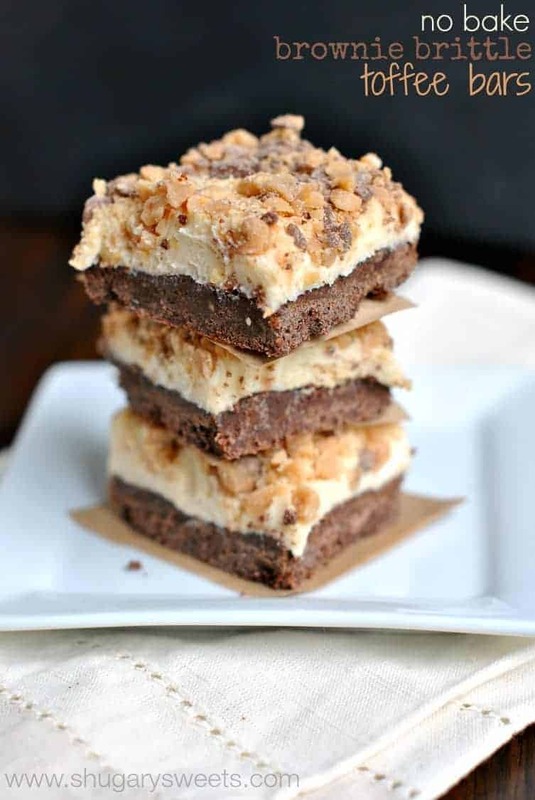 No Bake Brownie Brittle Toffee Bars. 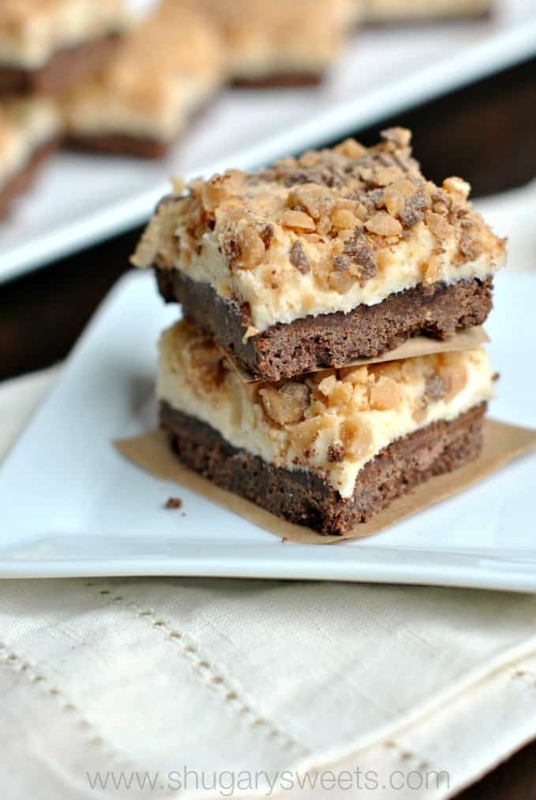 Fudgy Brownie Brittle base topped with a decadent caramel and cream cheese layer. Don’t forget the ridiculously generous amount of toffee bits on top! These will be your new go-to treat this fall. After whipping up a dessert like this, I’m just going to say. I love my job. Making delicious treats in your kitchen does not have to be time consuming. Doesn’t even need to involve an oven. Just a few tasty ingredients (like Brownie Brittle) and you can have this outrageously good dessert in your hands today! When the folks over at Brownie Brittle contacted me to create some unique treats using their product, I was all in. They wanted me to “brittle” one of my favorite recipes. It only took me a minute to think about what recipe would be great: Chocolate Peppermint Bars. Brownie Brittle is a great substitute for chocolate sandwich cookies in recipes. Love a rich chocolate crust? Grab a bag of Brownie Brittle. Trust me, it’s a delicious swap. By “brittling” today’s recipe, I swapped the cookies for a bag of Toffee Crunch Brownie Brittle. I combined this with my melted chocolate. Once you spread it in the bottom of a pan, you freeze while you make the topping. This crust is rich and fudgy, I think you’re going to want to Brittle all your recipes! 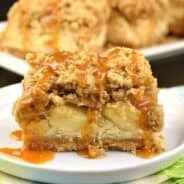 The creamy topping on the crust layer is what gives a mouthwatering contrast to each bite. This layer is cream cheese, melted vanilla bark (almond bark) and caramel. That’s it. Spread it over your hardened crust and immediately press in your toffee bits. I guarantee this dessert will be a huge hit in your house. If not, feel free to ship it to me, cause I know I will enjoy it! Line an 8x8inch square baking dish with foil. Set aside. Using a food processor, process the Brownie Brittle until it becomes a fine crumb. Pour into a bowl. Combine with melted chocolate candy coating. Pour into baking dish. Using the bottom of a cup, or your finger tips, press crumbs into the pan evenly. Place in freezer for about 10 minutes. Meanwhile, beat cream cheese for about 2 minutes until soft and fluffy. Add melted vanilla candy coating and caramel sauce. Beat until blended. Pour over chilled crust, spreading evenly. Immediately press toffee bits into the top of the bars. Refrigerate 20 minutes, cut into bars and enjoy! No bake? Best invention ever!! Toffee and brownie and no bake?! The way to my heart! Oh Aimee, how do you do it. These dessesrts are always the best. These bars look way way way over the top delicious! Pinning now. 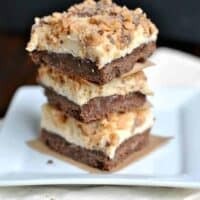 I love these no bake bars. Layers of delicious flavor. These would be a hit for a Christmas cookie exchange. I loooove brownie brittle! These look amazing! Oh boy. I need my fat pants for these babies! They look crazy delicious. Pinned! 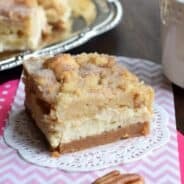 Love easy no bake desserts like this! 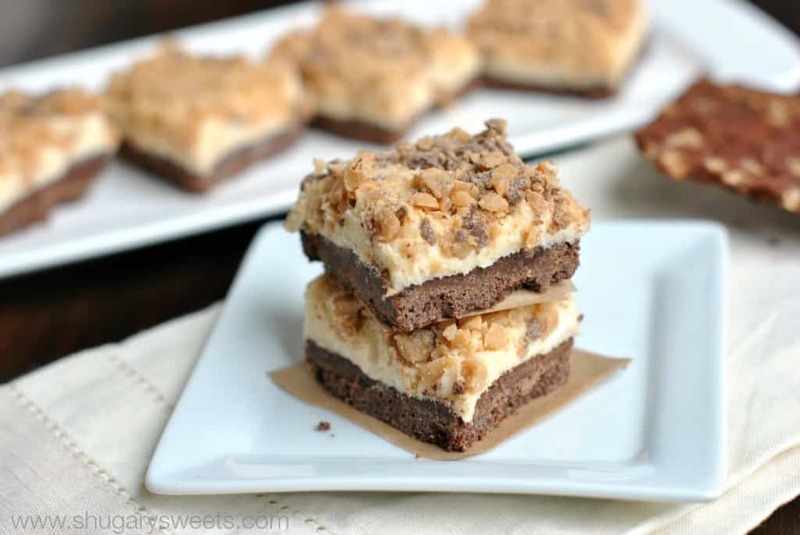 No bake, toffee, and Brownie Brittle…yup, I need these in my life for sure!!! What an awesome way to Brittle your dessert!!! Thanks girl!! I love a good challenge…especially when it calls for Brownie Brittle. Your way works too though. I don’t judge. Believe me, Aimee, I’d love to hang out in your kitchen, too! Great recipe. I can think of little that’s happier than brownie brittle with caramel and cream cheese elements! Amiee, you had me at no bake!! I don’t need to turn on my oven and warm up my house, then I am all in, Then I read the ingredients and I feel even more in love. These look delicious. Can’t wait to they them! Pinned!! Thanks for pinning Cyndi. I think you’ll LOVE these! Oooh I can’t wait to see what you’ve done. I have another one (no bake brownie brittle) coming next month!!! So much deliciousness. It’s so hard to believe that these are no bake?! Love the concept! Where do you find the Brownie Brittle? I’ve not seen it where we live. I’ve actually never had brownie brittle. I keep contemplating buying it in the store, but always convince myself I have enough sugar in the house. You’ve DEFINITELY got me reconsidering. These look amazing! can not believe they are no bake! I love that your job allows you to pump out delicious sweets like these bars. These look sinful. I love to brittle my recipes! I also wouldn’t mind taking a big bite out of one of these bars! This sounds so easy and SO delicious!! Love that brownie brittle crust…yum! Seriously. The crust is amazing. Just sayin!! These look crazy delicious! A must make for sure! Pinned! 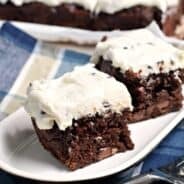 I’m so intrigued by no-bake brownies! I bet these are awesomely chewy and soft–just the way I like ’em! You had me at no bake! Sounds amazing! Nice idea! These look fabulous! These look amazing, so easy and fun! Those toffee bits on top are totally calling my name! (Probably helps that it sounds the same as yours… 😉 ) It seems like everyone is creating recipes with toffee, and it’s just killing me. I haven’t been able to get to the store to buy my own, but that’s changing this weekend! Just as soon as I run enough to justify it… Pinned! Yum! The crust definitely looks delicious! I love that these are no bake and I love toffee!! What a tasty and easy treat! I love Brownie Brittle so I know I’d love those toffee bars. They look heavenly!